A companion piece to Kathy Nguyen‘s short story “The Veteran” (which we reprinted last week). In this expansive essay, Kathy Nguyen reflects on her father’s love for pre-1975 Vietnamese music, and provides astute analysis alongside poignant recollection of how those nhạc vàng songs, played on repeat by her father, both contain history that has been elided, and provide emotional sustenance and paths of resistance, for the under-recognized experiences of South Vietnamese ARVN veterans. At night, geckos and crickets provided the soundtrack for our dreams and nightmares. When my mother spoke to me, she spoke softly, the tones of Vietnamese giving it music – not high and reedy, but scratchy and bluesy. I always wished I had her voice. Music was a constant in our family. Ever since I was able to discern sounds, I remembered hearing the sounds of the cassette player clicking, signaling the end of a tape, and my parents commanding us to “re-wheel the tape.” Re-wheel was/is their pronunciation for rewind, something we still say to irritate and humor my mother. My father was a Vietnamese Veteran, once serving the Republic of Việt Nam Navy, a former petty officer. 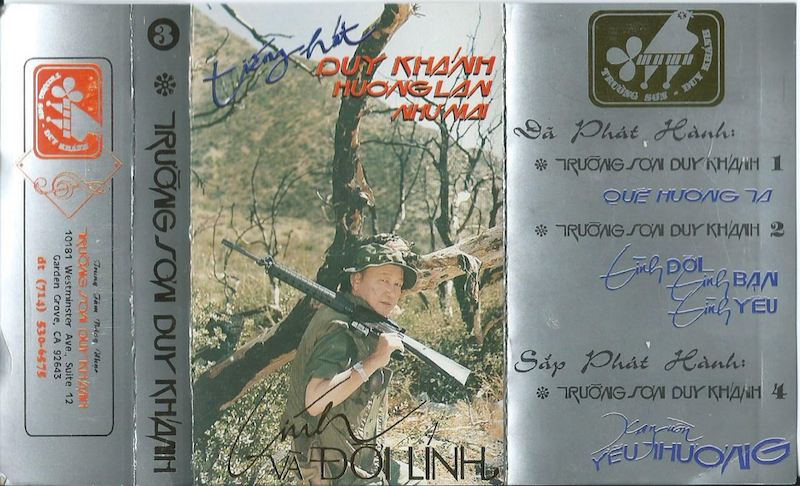 He was and remained a fan of pre-1975 Vietnamese music because those songs, particularly the songs about the lives and memories of soldiers, or as he often categorized, “nhạc lính,” resonated with him. He often told us how he’d met some of the singers – some had enlisted and served while some performed songs for the troops. There were instances where he would retell fond memories of seeing these singers as he listened to his tape collection. Vietnamese Veterans honor and remember each other – the dead and alive – through photographs, memories, uniforms they’ve stored, and Vietnamese broadcasting networks. It never stops for them. Never-ending stockpiles of memories trailing after them like ghosts. Sometimes these ghosts find themselves alive again through the constant rewinding of Vietnamese music, recorded pre-1975. Like shadows, these cassette tapes were/are living notes, the lyrics capturing Vietnamese civilians’ and soldiers’ thoughts on war. The noisy reels of cassette tapes – objects that are now considered obsolete artifacts – could always be heard playing in my parents’ house. Even after immigrating to the United States after the fall of Saigon, April 30, 1975, my parents continued to listen to pre-1975 music, or nhạc vàng (literal translation: golden music) and nhạc tiền chiến (pre-Indochina War music) (Valverde 35). In some ways, my siblings and I inherited their musical taste, but at the same time, I never felt a longing for a homeland I never visited. According to my parents, nhạc vàng songs were written by composers who served in the South Vietnamese military, worked in the government, singers whose spouses enlisted, or who had asked their friends and colleagues about their experiences of the war. Majority, if not all songs, were compositions that narrated a soldier’s life in the trenches, their thoughts about the war and their country, peace, departures, isolation, fear, sounds of guns and bombs, the wind blowing, images of smoke materializing into dark fog enveloping bodies and the entire sky, vivid memories in the rain, darkness, lightness, and shattered relationships. These songs represented the experiences of Vietnamese people who lived in Vietnam’s – what my mother often describes as – khói lửa (literal translation: “fire and smoke.”). As such, composers often wrote songs dedicated to the war and their memories of Sài Gòn. 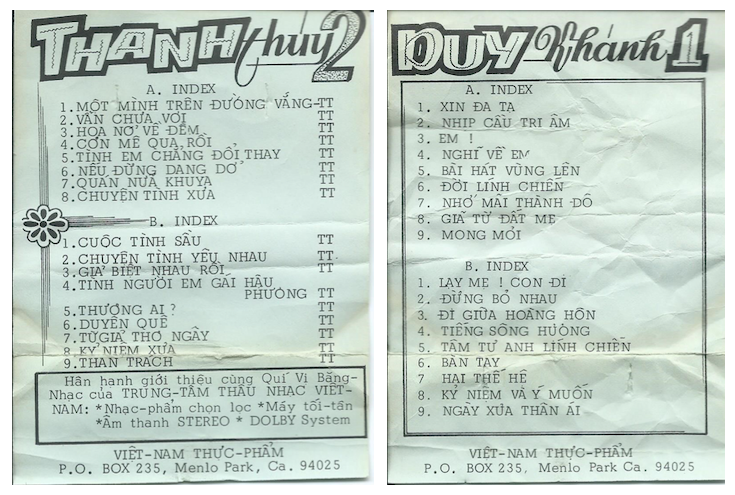 While the younger generation of Vietnamese singers, most likely the current second-generation, often re-sing/re-record these songs, my parents have always preferred the echoic tracks and recordings from the tapes they managed to collect. My parents hoarded multiple cassette tapes they bought at Vietnamese markets. Though hazy, I have memories of my father walking around Tuấn Hưng Supermarket in Fort Smith, Arkansas, browsing stacks of cassette tapes with a half-smile on his face. Those family trips were usually on a Saturday, often planned since the drive was at least 45 minutes away from our home in Fayetteville. Then they would play them at night, sleeping until the tape’s reel slowly stopped, the vivid sounds of that clicking noise signifying the end of the tape. Holes were drilled into white walls to mount cheap, plastic, multi-colored cassette storage racks. Sometimes, when there were bargains, my father would buy the wooden cassette tape racks. Those stayed on the floor. Upon entry, it was difficult not to notice the plastic cassette racks adorning the walls. Cheap, colorful cassette covers neatly stacked with no sequential significance, no priori. Their wrinkled aspects represented both the fragility of an era where immigrants, singers my parents adored, had exiled themselves from Việt Nam. Books may describe the choices as fight or flight. But for my father, it was flight or punishment, with the latter word possibly being deemed as death, hard labor, or worse. The covers of these cassette tapes were nothing extraordinary, graphically, but they represented the era in which they were produced: the humble , simple sounds that were accompanied with static and echo reverberations of both the musical instruments and the singer’s voices. Though technology and quality studio productions were not available in Việt Nam at that time, the emotional rawness in each singers’ recordings resulted in a more “authentic” sound. Recorded music pre-1975 represented a time where music produced not only the political tones of the country, but also presented the economic adversity and emotional turmoil resonating throughout the country. My parents’ usual mix-tape consisted of the following singers: Duy Khánh, Thanh Thúy, Thanh Tuyền, Chế Linh, Hoàng Oanh, Thanh Phong, Phương Dung, and Hương Lan. My parents often described them as the first generation of Vietnamese singers; while my siblings and I inherited our parents’ nostalgic musical tastes of the first-generation singers, we also listened to singers from the 1.5 generation. It wasn’t until recently I heard about the 1.5 generation (because I had mistakenly categorized them as second-generation singers); however, in one of Thúy Nga’s  DVDs, Paris By Night 77: 30 Năm Viễn Xứ , one of the many DVDs in my family’s Vietnamese music collection, Nguyễn Cao Kỳ Duyên – one of the MCs of Paris By Night and the daughter of former Vietnamese Vice President, Nguyễn Cao Kỳ – mentions that the 1.5 generation (singers) were born during the Việt Nam War, but were too young to remember the events; they immigrated and became overseas singers, re-recording pre-1975 songs to preserve not only their cultural arts, but the often disremembered and silenced memories not preserved in the dominant historical archives. Cassette tapes and CDs often laid amassed in my father’s room, along with a simple CD player and a black RCA cassette player, charmingly designed like a shoe box. Many memories he replayed over and over while simultaneously relistening to, reliving, and remembering the stories the singers sang about. Even after the polyester-plastic-magnetic tape was tangled into a spiral mess, my father would always find a way – usually with a pencil – to untangle the tape and manually re-wheel the tape back onto the reel, to be played again as if the cassette was new. Although he was familiar with the 1.5 and second-generation singers, he continued to listen to the singers he had seen performing onstage for the soldiers, and the singers and composers he’d met when he served. The songs produced at the time were not only evocative, but he, his family, my mother, her family, his friends and comrades had lived through and experienced the turmoil that haunted those lyrics. Even as some of the singers immigrated to the United States, production and recording studios in California established a community where they became overseas singers, re-recording the same songs they had recorded during the Việt Nam War. In his book, Nothing Ever Dies: Vietnam and the Memory of War, Viet Thanh Nguyen argues, “The problem of war and memory is therefore first and foremost about how to remember the dead, who cannot speak for themselves. Their unnerving silence compels the living – tainted, perhaps, by a touch or more of survivor’s guilt – to speak for them” (4). The nostalgia of pre-1975 is maintained by the albums, marketed as a form of war memorabilia. While the intersections of narratives, culture, memories, the dis/remembered, and demographics are different between the Western memory industry and the Vietnamese memory industry, nostalgia was and will always remain a marketing asset for several industries. But for Vietnamese Veterans, composers and singers – dead and alive – are only un-silenced by refugees who continue to listen, consume, and inherit their stories. The majority of pre-1975 songs were written by male composers and singers and, like most nhạc lính songs, Trúc Phương wrote about the lives of soldiers, men transitioning to being soldiers, serving for their country as they waited. A common refrain in nhạc lính songs are images of mountains, soldiers holding their guns, sounds of gunshots or bombs, leaving loved ones, songs about death of a loved one and waiting for soldiers to return, of green fields – perhaps a re/memory of the vast green fields of Vietnam – and a desire to fight for their country. While these songs may be perceived as nationalistic or lyrically propagandist, I believe the context should be considered. As my father noted, these songs were written as forms of deep personal reflections, and I would further argue that these songs, though absent in the Vietnam War narratives, were/are forms of political commentary. The lives of Vietnamese Veterans who fought in the Vietnam War, who abandoned their country to avoid persecution, forsaking their own citizenships to avoid entering re-education camps or persecution, who became refugees and immigrants after 1975 – these lives remain largely invisible in the incomplete and partially reported and written historical discourse. Ken Burns’ PBS documentary, The Vietnam War, focused on the American military experience. In Aimee Phan’s review published by the San Francisco Chronicle, she notes that while Burns did include interviews from both South Vietnamese and North Vietnamese military and civilians; however, there was “little coverage” from those voices. The narrative became an all too familiar Western historical textbook: “the narrative always veered back to its shiny center: the white American soldier and his complex feelings of fear, hatred, guilt and remorse” (Phan). This unfairly transmutes these veterans as the other/ed even as memories of the Vietnam War continue to haunt them. In addition, their voices remain muted in the West. For some refugees, they “are the living dead.” The memories of Vietnamese veterans are preserved through ghosts (the dead and the living), Vietnamese-based communities, and through the music and musical performances that are either purchased or streamed online. As I mentioned earlier, several songs are dedicated to soldiers who, as war refugees, have found themselves relegated as invisible as Vietnamese Veterans, while the label, “Vietnam Veterans”, is given to American citizens. Memory upgrades are inevitable; the dated needs to be reformatted to maintain itself. My parents still have their cassette tapes, but they also collected CDs, purchasing several albums that were reformatted into CD format with simple photographs of the artist reprinted onto a jewel CD case. Today, these sounds would be considered of poor quality, but my parents’ purchasing criteria was only this: albums recorded pre-1975 where the singers’ raw vocals could be heard without traces of studio manipulation. In fact, I purchased most of the CDs for my father, as a gift. I remember visiting Kansas with my mother and going to multiple Vietnamese markets and video and music rental stores, where I obtained several Thanh Thúy – my father’s favorite singer – CDs for him. I also remember the albums recorded pre-1975 that sold for $3 each, something my father marveled and pondered about. My father never disposed of the cassettes. Even if he had bought or was gifted a CD upgrade – an exact copy of one of his many cassette tapes reformatted into a CD for longevity – he would never throw out his original. All the originals are now rare, difficult to find. In Arkansas, these stores are almost nonexistent. The ones my parents used to take us to are now closed. The lyrical flow and passages of the songs heard on my parents’ cassettes are now upgraded into multiple digital formats. Similar to what Nguyen argues: studio producers and current (as well as pre-1975) singers are both honoring, and capitalizing on, pre-1975 nostalgia. There was a time where I thought the constant re-recordings and performances of these very songs were tedious, as they seemed to have aged out in the current landscape, upsetting my father in the process; it was a generational conflict underlined with multiple citizenry complexities. My father’s experience – legacy – as a soldier was maligned; and it’s likely his stories and experiences in the Republic of Việt Nam, and other Vietnamese Veterans, would never be archived in history. Of course, my father acknowledged that Vietnamese music had not progressed, was unable to move beyond the Vietnam War. He once argued it wasn’t necessarily regressive, but like ghosts, one just remembers them, never deviating from them. Music, as I have noted, connects the (recent) past to the (current) present. Some of the major, and most likely the largest and most popular, Vietnamese overseas recording and studio productions are Thúy Nga and Asia Entertainment; both studios, based in California, originated to specifically re/produce music for the Vietnamese diasporic community. Pre-1975 music has maintained its longevity because “besides its entertainment value, [it] also served to connect refugees and exiles to the homeland they thought they had lost” (Valverde 30-31). As singers immigrated to the United States as war refugees or in the postwar period, their lyrical notes transitioned into melancholic sounds defining the exilic and the dislocated. Cunningham and Nguyen write: “To be exilic means not, or at least not ‘officially,’ being able to draw on the contemporary cultural production of the home country” (120). Majority of pre-1975 songs are most likely banned in Việt Nam today. My father’s friend revealed that songs related to the SVN Armed forces between 1954-1975 are considered propaganda. This might be the very reason why overseas Vietnamese singers continue to perform and recycle/re-record pre-1975 songs: as an act of resistance; or as a political reminder of how composers, singers, and South Vietnamese Veterans who had remained in Việt Nam had to enter reeducation camps. Valverde also contends that “In the first decade after the fall of Sài Gòn, pre-1975 music was the staple of the Vietnamese American community” and there is a strong “desire to preserve a culture they perceived the Communist Party had destroyed” (32). Pre-1975 songs, as a result, are categorized as diasporic music. War refugees, immigrants, and Vietnamese Veterans who now live as diasporic ghosts, while they may be able to return as (former) citizens, are likely not able to return as singers. The political and historical erasures that were never archived in print media were/are re/recorded and re/produced as songs. In the present tense/landscape, singers re/recording pre-1975 songs are singing in a tone that denotes that the exilic and the diasporic collectively share a yearning to return to their homeland; of course, this can also be a romanticized undertone, as I have met and known people from Việt Nam who do not reciprocate the sentiment, and refuse to return due to censorship and unfamiliar governmental regulations and ideologies that are presently foreign to them. My sister and I had a conversation years ago: Vietnamese songs, like many songs, always (re)tell a story; the singing sounds like a historically emotive account, never quite a fairy tale, sometimes dreamy, sometimes nightmarish threads that are full of discords and shattered dreams. While my mother’s musical preferences for the first generation, pre-1975 singers echoes my father’s, her memories about the popularity and emergence of pre-1975 music are hazy. As I was speaking to her on the telephone, she informed me that because she lived in the rural villages of Việt Nam, she did not have access to the radio or any form of technological apparatuses that may have been available in the cities; however, she often listened to “cổ nhạc,” which can be translated as a form of soap opera style music. These very songs my parents listened to were written to unite the country and to convey the harsh economic, environmental, political, and sociological issues people were living under/with during the First Indochina War (1946-1954), and, eventually, the Second Indochina War/Vietnam War. The songs my father often listened to are what Valverde describes as “tân nhạc,” or modern music, which “began with the French presence in the early nineteenth century” (Valverde 30). 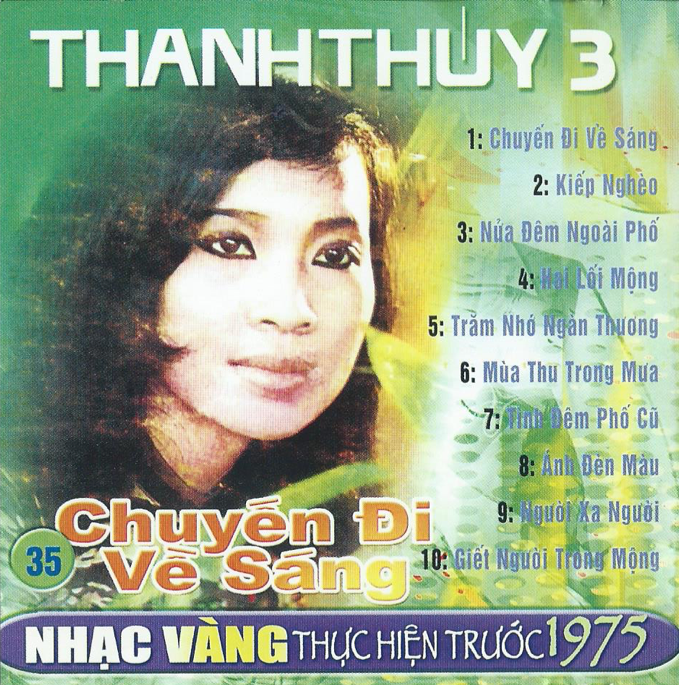 Perhaps due to French colonization, the French “injections” of their popular music became infused with Vietnamese contemporary music (Valverde 30). Thanh Tuyền and Chế Linh were/are considered sến or bình dân  singers. Of course, bolero remains the most popular music genre in Vietnam. This style, influenced by Latin American music and introduced in Việt Nam in the 1950s, became a staple musical genre in South Việt Nam, and much of its popularity is attributed to the emergence of pre-1975 music, and continues to carry over into the mainstream. My mother further commented that a radio was a staple in most households; people were listening to the news, cổ nhạc, or tân nhạc, but even then, my mother was always working in the fields to maintain the crops, and it was rare for her to leisurely listen to the radio due to the amount of fatigue she accumulated from working in the fields. Though my mother describes her memory as unreliable, she does remember the time when soldiers – my father included – would often send written requests for songs to play on the radio. Due to the technology of the time, these requests took a long time to process because there was a waiting list. The most requested song at the time was “Trên Bốn Vùng Chiến Thuật,”  composed by Trúc Phương, and perhaps first recorded by Duy Khánh. Not only is Trúc Phương’s legacy as one of the most popular bolero songwriters in the Vietnamese musicscape archived through re-recordings of his songs, showcasing his emotional trajectories and thoughts about the Vietnam War and the continued political struggles of the country, his lyrics continue to haunt on screen and through the speakers. Unlike my father, I fell in and out of Vietnamese music. My relationship with nhạc vàng is much different than my father’s. Although I inherited an emotional connection with the genre, I continuously fell in and out of love with nhạc vàng. This could be because some of my siblings and I held a shadowy grudge against my mother, who banned us from listening to anything other than Vietnamese music and the occasional Cantonese songs from the TVB  wuxia  series we often watched. Aside from listening to our parents’ favorite singers every night, I often selectively listened to some of the 1.5 generation singers, particularly Như Quỳnh, a singer I continue to listen to, both her old and newer songs. Many times did I feel exhausted by the stagnancy of Vietnamese music. Partially because I’ve heard multiple renditions of the same song, the atmospheric nature of whichever might have been the first rendition sometimes loses its authenticity. I’m not sure what constitutes authenticity or how it is measured anymore. But, I do think that the current re-recording of classic nhạc vàng is based on an industrialization of memory. I borrow the term from Viet Thanh Nguyen’s book. Viet Thanh Nguyen extensively interrogates the compounded and aggregated connections between memories, narratives of the Vietnam War, and identity. For Nguyen, the foundation of profitable war films is grounded on “the industrialization of memory,” which he describes “parallel[s] with how warfare is industrialized as part and parcel of capitalist society, where the actual firepower exercised in a war is matched by the firepower of memory that defines and redefines that war’s identity” (13). The industrialization of memory, as Nguyen notes, is profitable because memories have longevity due to their “life cycle” and, as such, a “memory industry” exists to capitalize on both history and postwar memories “to consumers hooked on nostalgia” (12-13). Memories of wars are treated as commodities; however, Vietnamese Veterans also consume postwar nostalgia and sometimes their memories are rooted within their ideological differences. Memories are not monolithic; they can change and shape one’s fluid identity. Memories of wars are grounded on “citizenry” because “[e]ach war has a distinct identity, a face with carefully drawn features, familiar at a glance to the nation’s people” (Nguyen 5). Of course, this citizenry is challenged when soldiers are geographically displaced, losing fragments of their identity and their citizenship. Perhaps my parents were right – since I was born in the United States, I embody a different, complex relationship with my dual identity/citizenry. Diasporic music, now, as I listen to it again, is situated within the liminality, in-between geographical thresholds. Something I’m still reconciling with myself. Nhạc vàng songs are like ghosts living in and out of diaspora, trailing behind Vietnamese veterans, rewinding themselves, back to their country and the struggles of living through destitution and ideological polarization. Moreover, this essay is framed on one of Nguyen’s many questions: “But what if the living are already dead, and the dead are somehow alive?” (233). Because, what is the difference between a living and dead Vietnamese Veteran? What is left of their memories and legacies? Is it through the recyclization of pre-1975 songs? This is likely. Their bodies and perhaps the memories of their service disappear, but the music is preserved and scatters to the next generation to haunt them. Only if the younger demographic – the future generations – want to hit the rewind button to maintain their families’ untold histories and culture. The future and perhaps the present can emulate the past; newer singers may re-record a song several times but, for my father, the authentic core emotion remains with the pre-1975 singers, making the songs simultaneously timeless yet unable to evolve further. After watching one of the many DVDS from either Thúy Nga and Asia Entertainment, my father would always comment: “That singer is irreplaceable once s/he dies because their voices are unique and rare.” I have no doubt that pre-1975 music will remain archived through DVDs, Blu-Rays, CDs, and various digital formats, but what happens when the pre-1975 generation also disappears/passes? What happens to the ghosts? Will they too experience expiration? Or will the younger generation continue with their industry of nostalgia? I’ve kept most of my father’s original cassette tapes since he passed away in 2017. Memories of him playing those tapes in his black RCA cassette player, something I also inherited, are too vivid for me to get rid of. The rattling of the cassette player noises and the sight of frantically spinning CDs are all memories of my father. Inheritance is complicated with simultaneous nuances and intricacies. I’m sure that I’ve inherited my father’s stubborn, unchanging musical tastes, his quiet cynicism, his faraway resignation, all of which are a part of the Vietnamese diaspora. Perhaps I’m becoming like him: hoarding memories, further contributing to the industry. I still listen to Vietnamese music. Vietnamese music still flows in the CD player of my old car, playing a mixed CD that I burned several years before, which consists of both the first and 1.5 generations of the Vietnamese music industry. It took me years to realize that through the repetitive recordings and weary recycling of Vietnamese music, a genre that remains popular in the Vietnamese community, we also have many singular cultural and historical artifacts, these songs that continuously re-tell the plight of Vietnamese immigrants and Vietnamese Veterans, those who served their country, like my father did, but were erased, disregarded as voiceless ghosts that remain silenced and unmentioned in western history books. Only the future was non-rewindable, ejecting whomever from their comfortable barracks, constantly replaying their nightmares in the continuous, present loop. A firm press of the stop button wasn’t enough to halt the constant projections of the past even as all four wheels of my car continue to rotate. I’m still uncertain if I’m entirely part of that loose, precarious wheel, (re)cycling and inheriting my father’s memories. Resignation is what I hope not to have fully inherited as the CD player begins to re-wheel the songs on loop again. There are several songs written about Sài Gòn, most likely in memory of the fall of Sài Gòn. 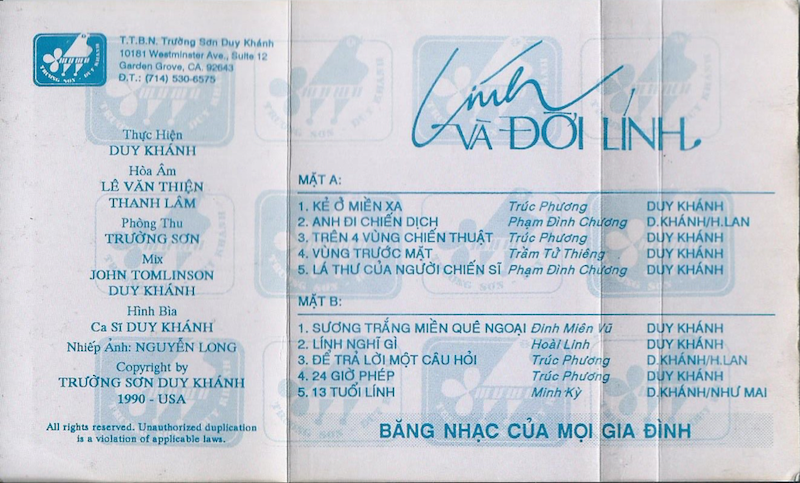 A few song titles include: “Đêm Nhớ Trăng Sài Gòn” (“A Night to Remember Sài Gòn’s Moonlight”), composed by Phạm Đình Chương / Du Tử Lê; “Đêm Nhớ Về Sài Gòn” (“A Night to Remember Sài Gòn”), composed by Trầm Tử Thiêng; Sài Gòn Thứ Bảy” (“Saturday in Sài Gòn”), composed by Anh Bằng (1926-2015); and “Sài Gòn ơi, Vĩnh Biệt” (“Farewell, Sài Gòn”), composed by Lam Phương. This list is not exhaustive. Here, I would like to thank my good friend, Marlene Flores for allowing me to use her description of Vietnamese music after introducing her to pre-1975 music. It’s a great word to describe this genre/era. As Ashley Carruthers notes in her article, “Saigon from the Diaspora,” Thúy Nga “is the oldest overseas Vietnamese media company, and it continues to stage the most lavish and, for many, the most exciting productions” (73). Stuart D. Cunningham’s and Tina Nguyen’s article, “Actually Existing Hybridity: Vietnamese Diasporic Music Video” also mentions the history of Thúy Nga. Both Thúy Nga and Asia Entertainment have their own historical origins; see Cunningham and Nguyen (121-23) and Valverde (31). A Hong Kong television broadcasting company. A martial arts genre with fantastical elements. Nguyen also argues that “emotion and ethnocentrism are key to the memory industry as it turns wars and experiences into sacred objects and soldiers into untouchable mascots of memory, as found in the American fetish for the so-called Greatest Generation who fought the so-called Good War” (13). For example, what about Vietnamese civilians and soldiers who were and still are affected by the aftermath of Agent Orange? Carruthers, Ashley. “Saigon from the Diaspora.” Singapore Journal of Tropical Geography, vol. 28, pp. 68-86. Cunningham, Stuart D., and Tina Nguyen. “Actually Existing Hybridity: Vietnamese Diasporic Music Video.” The Media of Diaspora: Mapping the Globe, edited by Karim H. Karim, Routledge, 2006, pp. 119-34. Nguyen, Viet Thanh. Nothing Ever Dies: Vietnam and the Memory of War. Harvard University Press, 2016. Phan, Aimee. “Ken Burns’ ‘The Vietnam War’ Offers Some Narrative, With Little Perspective.” San Francisco Chronicle, 03 Oct. 2017, sfchronicle.com/opinion/openforum/article/Ken-Burns-The-Vietnam-War-offers-same-12250472.php. Accessed 04 October 2017. Valverde, Kieu Linh Caroline. “Making Vietnamese Music Transnational: Sounds of Home, Resistance and Change.” Amerasia Journal, vol. 29, no. 1, 2003, pp. 29-49. 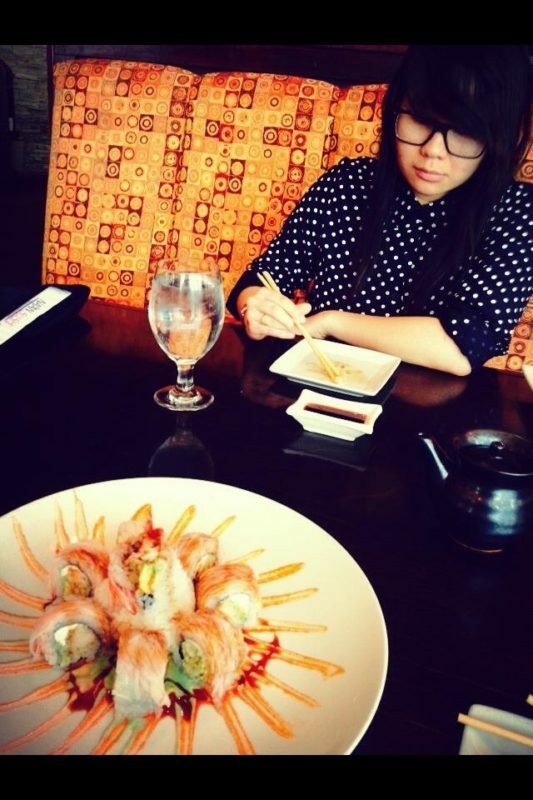 Kathy Nguyen is a doctoral candidate in Multicultural Women’s and Gender Studies at Texas Woman’s University. Her parents became refugees after the fall of Saigon in 1975 and permanently settled in Arkansas after temporarily being rehomed in Fort Chaffee. Kathy attended the University of Arkansas where she received both her bachelors and MSW. Broadly, she is interested in Asian diasporic narratives and the memories associated with the loss of home and disappearance of citizenships, often examining them through literature and music. While not musically gifted, she has fond memories of listening through her parents’ cassette tapes and watching musical variety shows on VHS and DVD with them. Interestingly, she learned to read and write Vietnamese, though not very well, by watching Vietnamese karaoke DVDs, much to her parents’ bemusement. This applies to all migrants and even those who have not migrated as memories of places/songs known in a different age remain. I have a memory of unknowingly keeping an audio-cassette on while I was taking my Residents to breakfast. Soon I hear the sound of a sob in the backseat – the CD was playing a famous song by Raj Kapoor ” Mera Joota Hai Japani ( my shoes are Japanese). The resident a Russian emigre remembered the song from his childhood. Raj Kapoor’s films were very popular in Russia in the 50s and indeed are still popular in many countries today. Thank you for this beautiful essay!